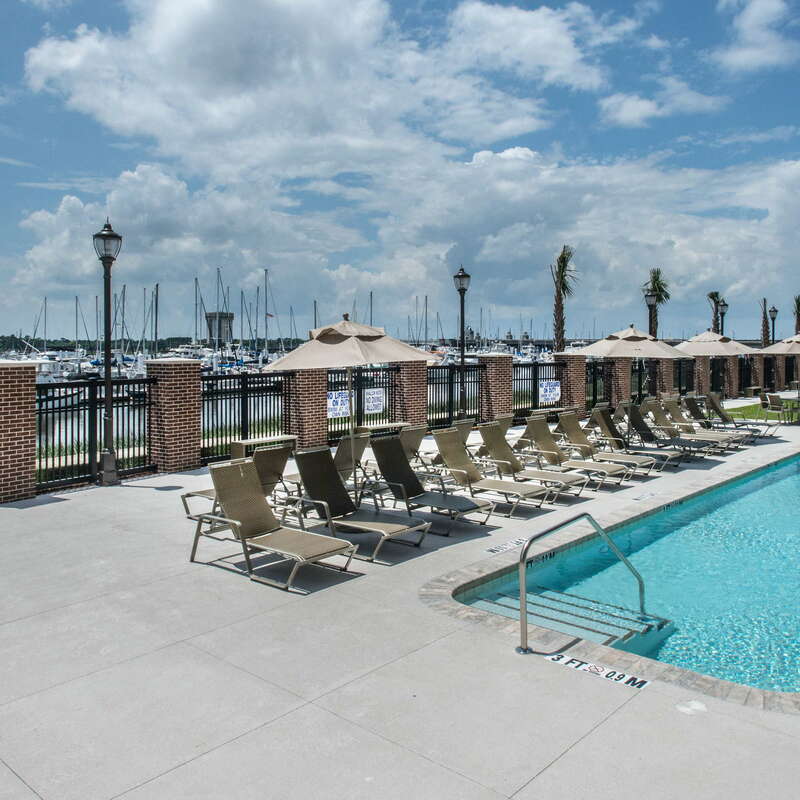 Nestled on the banks of the Ashley River, the Hilton Garden Inn Charleston Waterfront is a handsome brick building that overlooks a picturesque marina. Built in 2014, the hotel offers perks many historic district inns don’t, like free parking (complimented by a complimentary shuttle) and affordable rates. 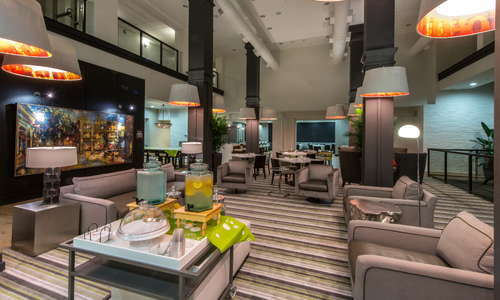 Clean, comfortable rooms and common spaces, a rooftop bar, and a sunny swimming pool please families, while the hotel’s speedy WIFI, business lounge, and easy access to the city’s main highways make it a popular stop among corporate travelers. Outfitted in contemporary furnishings and a bold lime green, blue, and red palette, rooms are decent in size, quiet, and comfy. 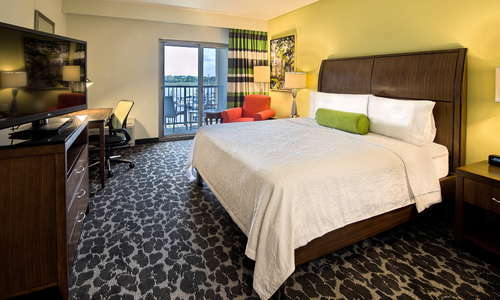 A microwave, mini-fridge, and Keurig coffee brewer add to in-room convenience to your stay. 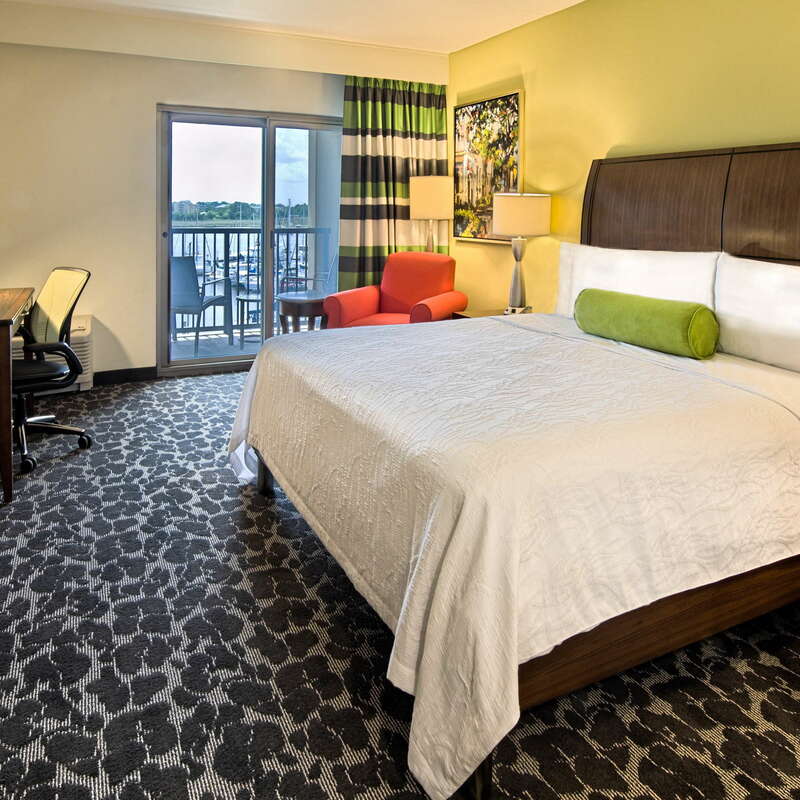 For an extra sitting area, book a suite. And to wake up to an oh-so Charleston scene outside of your window, request a room with a water view (some even have balconies). Faux marble tile gives the spacious bathrooms a fresh feel. A modern reception space outfitted in art that resembles marsh grass reminds you that you’re in the Lowcountry. Self-serve flavored water is a nice treat, which you can enjoy in one of the lobby lounge’s plush chairs. 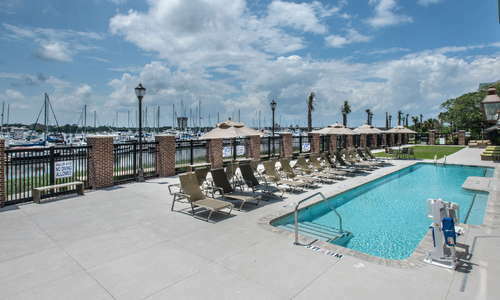 The ground floor’s breezy outdoor pool overlooks the Ashley Marina. With handicap accessibility, it’s available to all travelers, and is flanked by a row of cozy chaises with umbrellas for easy shade. Pack your gym clothes: a simple fitness room makes working out convenient. 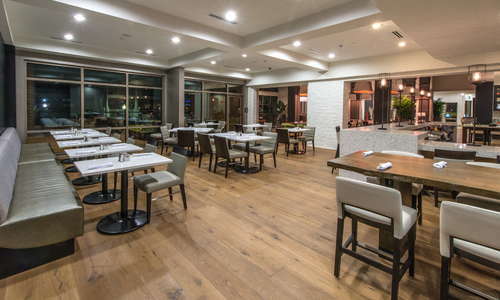 A full breakfast and locally inspired lunch and dinner dishes are cooked up in the onsite Garden Grille & Bar. Light bites to accompany your libations are available at the rooftop bar, while grab-and-go snacks are sold at the lobby convenience store. YOU SHOULD KNOW Food at the hotel is convenient, but not the tastiest. It may be wise to save your dining dollars for off-site eating (you are in a culinary Mecca, after all). Make your way to the 45 Waterside rooftop bar to sip spirits under bistro lights as you overlook the Ashley River. YOU SHOULD KNOW The view is a perk. However, expect to pay pretty steep prices for a rather mediocre assortment of wine and spirits. Also, know that the bar’s only open from 2 p.m. until dark and is subject to the elements as it’s all outdoors. Park your car in the free lot. From there, take advantage of the hotel’s complimentary shuttle, which will transport you to and from the historic district, or hail a ride-share. 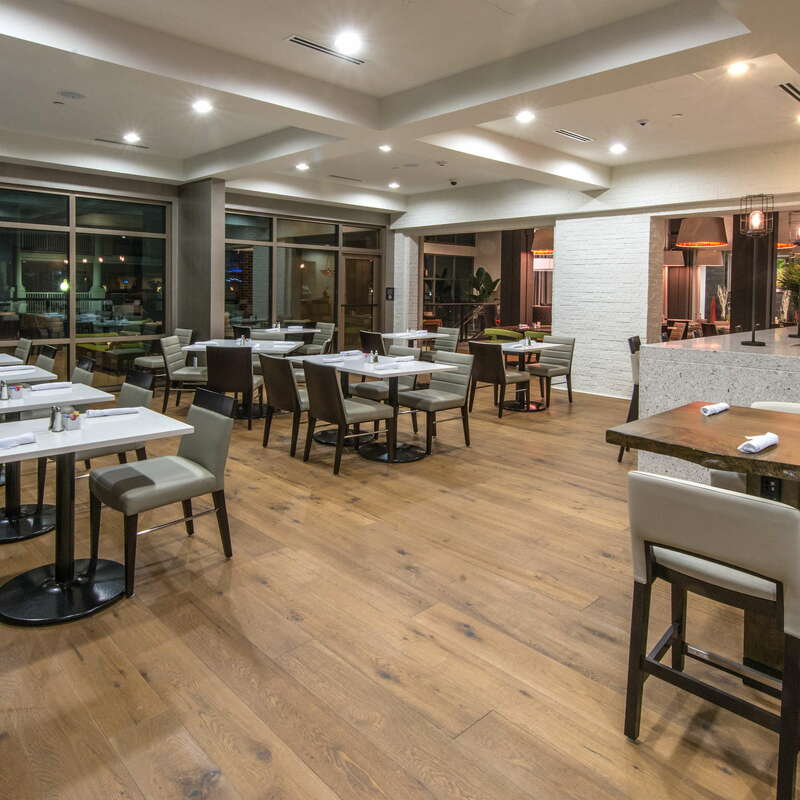 For views of Charleston Harbor and a kid-friendly, seafood-heavy menu, try Fleet Landing (11-minute drive). 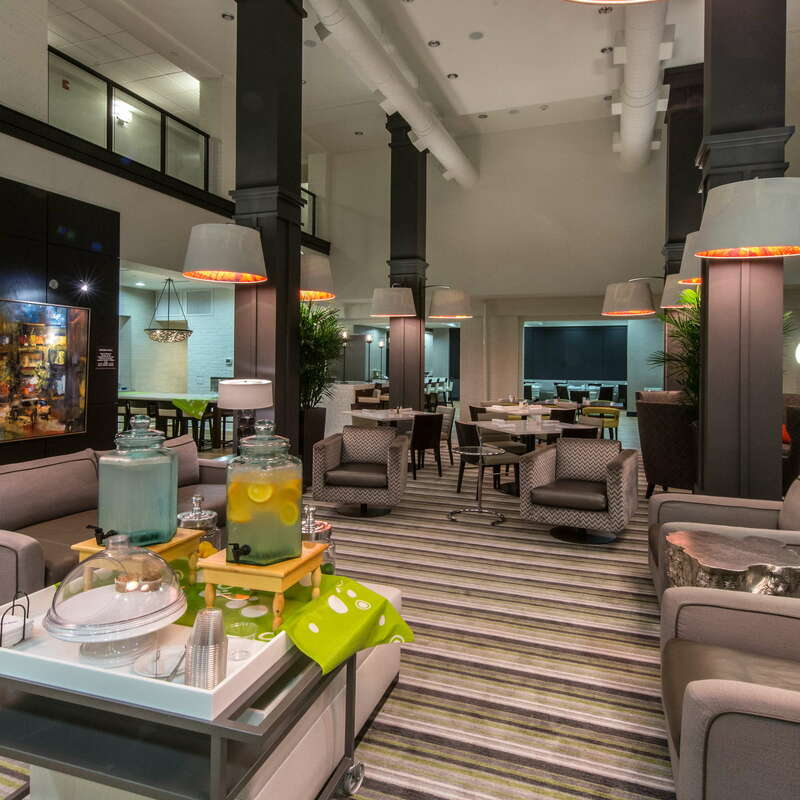 Fancy a fancier dining experience? Slightly North of Broad (9-minute drive)—AKA SNOB—or Magnolias (9-minute drive) will deliver classic Lowcountry fare with aplomb. Sip cheap beer as you soak up marsh views at the nearby Salty Mike’s Deck Bar (5-minute walk). For a well-heeled happy hour or nightcap, hit up The Belmont (8-minute walk), where craft cocktails are made fresh right in front of you. Sunset over the Ashley River is a sight to be seen, and you’ll have a front-row seat to it on the rooftop bar or from the pool. 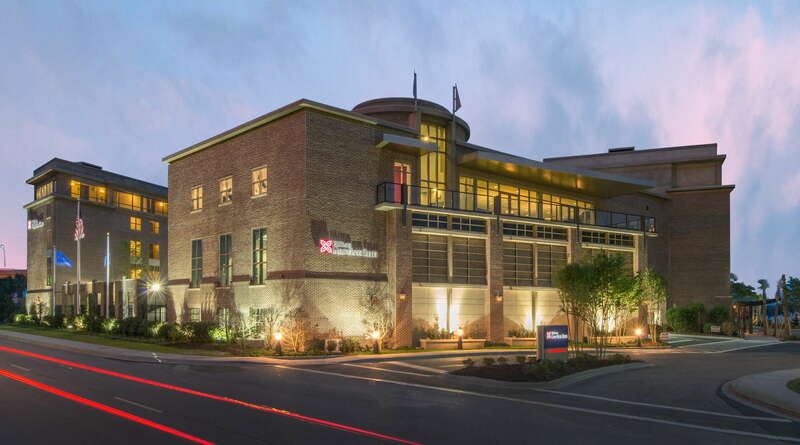 The complimentary shuttle makes the hotel’s short drive to historic Charleston a non-issue—especially considering the more economical rates you’ll enjoy. $$ &middot; 20 Patriots Point Rd. $$ &middot; 1 Center St.
$$ &middot; 415 Meeting St.
$$ &middot; 425 Meeting St.
$$ &middot; 67 State St.
$$ &middot; 16 Patriots Point Rd.